Originally from Ireland, Dave Martin had a long career with Scotiabank that took him to some interesting places. He lived and worked in Bermuda, Toronto, and London, England, before landing in Halifax in 1987, where he held several management positions with the bank, including District Vice President. Dave settled in Halifax with his spouse, Doreen, raised two children, and became very involved in community work. 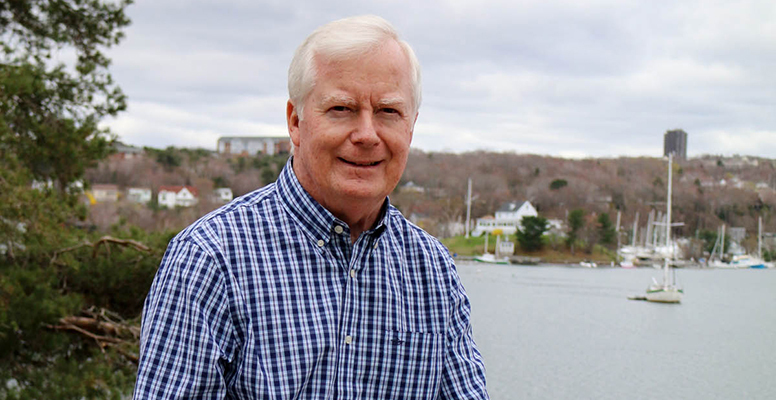 Over the years, he has made exemplary contributions volunteering with the Halifax and Nova Scotia Chambers of Commerce, the Nova Scotia Agricultural College Foundation, the University of King’s College, the Victorian Order of Nurses, Autism Nova Scotia, and Rockingham United Church. In 2001, he joined the Symphony Board of Directors, and went on to serve two terms as Vice Chair. During that time, Dave also served as Major Gifts Chair, and played an active role in the highly successful “Listen To The Future” endowment fund campaign. Since his retirement in 2006, Dave has maintained his ties with the Symphony as a subscriber, donor, and more recently as a member of the Legacy Circle. About 25 years ago, Dave took out a subscription to the Symphony. A lot of his friends, colleagues, and clients were patrons, and he says that’s what initially drew him in: “I didn’t have much of a background in classical music, and wanted to learn more about it.” Over the years, his appreciation for the orchestra grew.